Learn concentration and meditation techniques to deal with pressure and enjoy challenges. You will be guided by author, entrepreneur, speaker and maverick life coach Jackie Reardon. The Friendly Eyes courses are based on the Mindset books. ‘Friendly Eyes’ changed my life. I learned about it more than ten years ago and it has positively changed my private life and my work as a coach. The tools and exercises helped me to become aware of my ‘mindset’. I realised how judgmental I often was towards myself. Thanks to Friendly Eyes I was able to move from judging into kindness. This makes a world of difference! The learning never stops, even after having watched Discover many times, I keep on discovering new things about myself. But it has been just as important in my work, I can directly help students in their mental game because the exercises are super practical. And they’re great fun to do, no matter your age! 3 years ago I had the opportunity to work with Jackie for 3 days, it has become the 3 strongest training days in my professional career. Every day I get back to what I have discovered there. I did the Friendly Eyes 3 month meditation course and this taught me to look with compassion and friendly eyes to my own and other people’s actions. I highly recommend the Friendly Eyes courses. Friendly Eyes has meant a lot to me. It is very practical and I apply it daily. Friendly eyes, good mistakes and no judgment have made me different in my daily life. I also give ‘friendly eyes’ training to young football players and students to learn how to focus and look at themselves without judgment. Friendly eyes can be an enrichment for your daily life. Enriching life lessons for everyone. Both on the sportfields as in everyday life. I love the inspirational insights and challenges Jackie offers every time. Take the time to dive into this. I’m positive it will bring you as much as it still does to me! 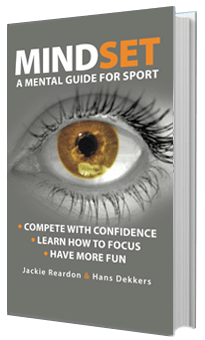 Over the past 10 years, I have found Jackie Reardon’s Mindset book and its practical methodology/ application extremely helpful in becoming more successful as a tennis coach in assisting young competitive juniors develop their mental skills to assist with their performances. Her follow up web-site of FRIENDLY EYES is a remarkable progression that I highly recommend to everyone. I can watch the clippings over and over and it’s also helps with reinforcing its practical application and training on a daily basis with the players. They are learning so much better how to put “Friendly Eyes” into practise and to recognise “Story Thinking” and how to train for “Action Thinking” using her pillars to train awareness and self- management. I have certainly seen great improvement in their concentration skills and staying in the moment, dealing better with the pressures of competition and coping better with their emotions and mistake management using her suggested instruments. Seeing and hearing the video clips of elite athletes and highly successful artists lends huge credibility and in turn this also helps tremendously with developing their own improved court presence and inner calmness. The Mindset book and the online program helped me to look with ‘friendly eyes’ at myself and people around me. And because of that, Friendly Eyes makes me a better person. I can highly recommend to everybody that this online mental training is worth following. It helped me a lot during my work in sports and also in daily life. I learned to focus better and this improved my quality of life. I especially like how practical friendlyeyes is. It’s a process but you get instant tools to start practicing.